Setting foot on Mars is one thing, but extended astronaut stays on the Red Planet will require tapping the planet's resources, experts say. NASA's quest to put boots on Mars in the 2030s is advancing, bolstered by new studies about a multifunction, next-generation Mars orbiter and the best ways to use Red Planet resources to sustain astronaut pioneers. Last year, scientists proposed nearly 50 locations on Mars as possible places for future human landings. Those landing-zone sites contain "regions of interest" that can be reached from primary touchdown spots. With its suite of instruments and cameras — particularly the sharp-shooting High Resolution Imaging Science Experiment (HiRISE) — NASA's Mars Reconnaissance Orbiter (MRO) is being put through a request process called "HiWish" to snag new images of landing-zone candidates. "NASA's Human Exploration and Operations Directorate has begun to think about where human explorers should go on Mars, and what conditions and resources, as well as what science targets, may be present," said HiRISE principal investigator Alfred McEwen, director of the Planetary Image Research Lab at the University of Arizona in Tucson. "This is a sign that they are actually thinking about sending people to Mars." 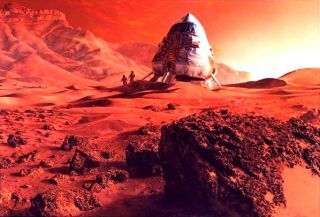 "Hopefully, this new interest in Mars will include support for future robotic missions needed to answer key questions," McEwen told Space.com. Last year, scientists identified nearly 50 prospective human landing zones on Mars — locations that are safe, scientifically promising and resource-rich. Indeed, many experts within and outside NASA would like the agency to launch a multifunctional, next-generation Mars orbiter, the potential benefits of which were laid out in a report published in December by the Science Analysis Group of the Mars Exploration Program Analysis Group. NASA is considering launching a multifunctional, next-generation Mars orbiter sometime in the 2020s. Among other tasks, this spacecraft would scout out resources to help sustain human expeditionary crews. This Mars orbiter could employ solar electric propulsion, carry advanced telecommunications gear and make use of powerful radar to scout out and better classify Martian resources for human landing parties. If approved, the spacecraft may be headed for Mars as early as 2022, NASA officials have said. "We use orbital assets at Mars for telecommunications relay from the surface … and they are getting a little long in the tooth," Jurczyk told Space.com. Mission planners are thinking about adding a couple of technologies to a prospective Mars orbiter, Jurczyk said — perhaps high-power electric propulsion. Deep-space laser communications technology, which could boost bandwidth capabilities by a factor of 10 compared to standard radio-frequency hardware, might be on board as well, he added. Last month, NASA released the Mars Water In-Situ Resource Utilization (ISRU) Planning Study, which looked into how astronauts could tap into Red Planet water. "There's an intuitive gut-level view," said Richard Davis, assistant director for science and exploration in the Science Mission Directorate at NASA headquarters. "Human beings in general don't go where there isn't water. That intuition is actually on the mark for Mars." One small step — with big expectations to eventually homestead the Red Planet. Water on Mars is transformative, and not just for drinking and growing crops, many experts believe. Processing the stuff can generate breathable oxygen and propellant for Mars ascent vehicles, among other things that could aid extended human stays on the Red Planet. Davis, who worked on the ISRU report, said new data from orbit are needed to identify Martian resources that expeditionary crews could use. But orbital information by itself is probably not enough, he added. "In the end, you need ground-truthing by sending a lander to what you think is the human landing site to validate [resource availability]," Davis said. One resource option the report ruled out is the extraction of water from the thin Martian atmosphere. Setting up a semi-permanent Mars base will require crop growth on the planet to sustain explorers far from Earth, experts say. The mass, power, volume and mechanical complexity of the system needed for this approach are far beyond what is practical for deployment on the Red Planet, Davis said. "The density of the water in the Martian atmosphere is so low, it would take a massive processing system," he said. "There's no way we can get there." Water-rich minerals on Mars look far more promising, Davis said. "They require so much less power to actually free up the water molecules," he noted. The idea of strip-mining Mars for subsurface ice deposits was reviewed in the study but got a thumbs-down, Davis said. A better approach, including to the report's authors, involves boring a hole down through the Martian dirt, vaporizing subsurface ice, bringing it up topside as a gas and then condensing that gas into liquid. "You make the Martian environment work for us instead of against us," Davis said. "It looks very promising." The new study is far from the last word on finding and using indigenous Martian resources, Davis said. "For each resource feedstock on Mars that's validated, we need to understand the technology needed, the mass of the equipment required and the power it will take," he said. Once a semi-permanent base on Mars is established, crews would set up ISRU equipment, make sure all the kinks in the gear are smoothed out and then start harvesting resources. ISRU hardware would also operate in autonomous mode when there were no humans at the base, Davis said. "You don't achieve sustainability on Mars overnight. You grow to it," Davis said. "This is not a technical problem. Yes, there are technical issues. But it is a belief problem. If people believe it's achievable, then it will be achievable."